Lovely aromas of honeysuckle, white peach and Meyer lemon with undercurrents of guava and gravel. This Sauvignon Blanc displays fresh, expressive aromas of white peach, honeysuckle and Meyer lemon with undercurrents of guava and gravel. The flavors echo the aromatics, with hints of pear and spice. The wine’s crisp acidity is beautifully balanced by a remarkable silky richness that frames the wine. The lingering finish is crowned by a perk of natural acidity. 100% Vogelzang Vineyard. 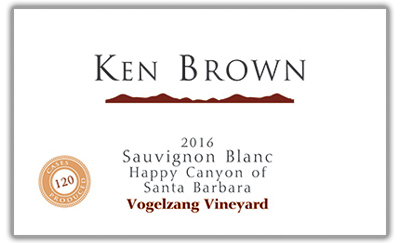 This vineyard is situated in the “sweet spot” for Sauvignon Blanc in Santa Ynez Valley. Because of its location in the southeast corner of the valley, the morning fog burns off earlier than the rest of the area, providing longer and warmer days. Late afternoon marine breezes temper the heat, ensuring good hang time for the fruit. Gravely loam soils provide excellent drainage and contribute to the low vigor of the vines. Clones sourced include 70% Sauvignon Blanc Clone 1 and 30% Sauvignon Blanc Clone Musque. Unseasonably warm weather in February was moderated by cold nighttime temperatures, suppressing budbreak until early March, a bit later than the 2014 and 2015 vintages. While the limited winter rainfall was disappointing, the timing was advantageous. Most precipitation fell January through March, allowing flowering and set to occur without the threat of damage. Vogelzang fruit was the first to be harvested on August 18. The rest of the harvest season saw cooler temperatures alternate with short warmer spells, which helped winemakers target optimum ripening of the fruit. Crop yields were average and berry size was small to medium. These Sauvignon Blanc grapes were handpicked and gently pressed as whole clusters. The juice was fermented and aged for 9 months in a combination of 50% stainless steel barrels and 50% neutral French oak barrels. This combination imparted the right touch of complexity and richness to the wine without overshadowing the fresh nature of the fruit. No malo-lactic fermentation took place. The wine was bottled on May 24, 2017.